A rich holiday treat, eggnog is a favorite drink for Christmas parties and other holiday gatherings. The secret to great eggnog is quality ingredients and it doesn't have to be difficult to make. While there are many eggnog recipes, this brandy eggnog is one of the easiest. 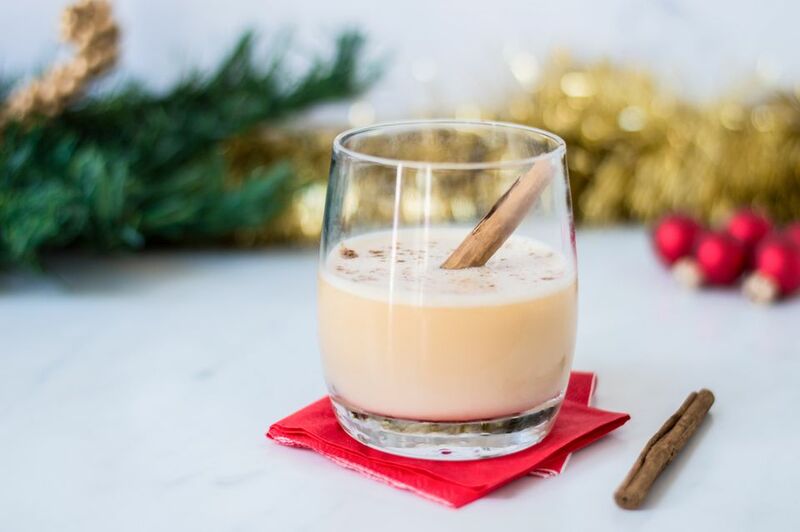 With the same amount of effort you put into any other cocktail, a delicious glass of nog will be ready for you to enjoy. For this recipe, you will need just four ingredients and a cocktail shaker. It's very similar to the eggnog you might get at the bar, with a perfect balance of brandy and satisfying creaminess. This is a fabulous made-from-scratch eggnog that is too easy to pass up. You'll find that it surpasses the taste of almost any pre-made eggnog you can buy at the store, too. Who knows, it may even bring some anti-noggers over to the 'nog side. In a cocktail shaker, combine the brandy, milk, simple syrup, and egg. Fill the shaker with ice, then shake vigorously for about 30 seconds to ensure the egg is well mixed. Strain into an old-fashioned or cocktail glass. Add a dash of grated nutmeg or cinnamon as a garnish. The secret to good eggnog is in using quality ingredients. Brandy is one of the traditional bases for eggnog, but it's not your only option. Rum has long been a favorite and many whiskies make a nice eggnog as well. In fact, this recipe is perfect for trying out all three liquors to see which you enjoy most. You will be amazed at the differences and the experiment is a lot of fun. Most brandies will make a great eggnog. Keep quality in mind and don't be too much of a cheapskate, though. A great eggnog deserves a nice brandy and there are good options available at all price ranges. For rum, stick with aged or gold rums. White rums tend to get lost in the mix and spiced rums can be too much spice for some drinkers. This is especially true if you have digestive issues. After all, you're already drinking raw egg and spiced rum can be an irritant on its own. Whiskey is another story. Each style and each brand will create a different flavor profile in your eggnog. Bourbon, rye whiskey, and blended Canadian whiskey are preferred options but don't discount Irish whiskey. Since you'll be drinking a raw egg in your nog, you need to make sure that your eggs are fresh. There's a simple way you can test an egg's freshness and it involves a glass of water. If the egg floats, pass it up because it is a sign that it's an older egg. For any egg cocktail, use only those eggs that rest on the bottom. This will ensure the best tasting drink and reduce the risk of salmonella. If you like, you can use an egg substitute, though a real egg does create the best tasting eggnog. Using the yolk alone gives the cocktail an eggy flavor, which is exactly what we want for eggnog. The egg white is not necessary here because we're getting a creamy texture from the milk. When shaking drinks with eggs, begin with a dry shake without ice. Ice is added during the second round of shaking and you want to shake longer and with more vigor than you would any other drink. This process helps ensure that the yolk gets broken up and thoroughly mixes with the other ingredients before you pour the drink. It may take more effort and your arms may hurt, but that's the sign of a good shake. How Strong Is This Eggnog? Eggnog has a nasty reputation for getting holiday revellers a little too tipsy. Whether that is a matter of one cup too many or an overpouring host, we're not going to judge those things. In reality, this particular recipe is relatively mild and has an alcohol content of around 14 percent ABV (28 proof). That's about the same as the strongest wines, so don't blame the eggnog.